‘Concert Design’ is a design concept developed through a doctoral thesis and practical experimentation of designing live performance. The focus is of this presentation is on designing embodied, aesthetic and communicative aspects in choral music performance. The presentation begins with an overview of the ‘Concert Design Concept’ and a brief explanation of the theoretical work behind. The methodology is exemplified through a few practical exercises and will provide insight into the craft of designing choral performances through new ways to communicate through song. Astrid Vang-Pedersen recently finished her PHD on ‘Concert Design’, a concept focusing on how to create innovative concert events. 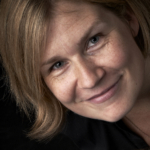 Astrid also works as a freelance choral conductor facilitating masterclasses and workshops in her home country Denmark, as well as abroad. She conducts two vocal ensembles: Dopplers (www.dopplers.dk) and Papaya (www.papaya.dk), which both focus on theatrical and communicative aspects of performing vocal music. Astrid also works as composer and arranger.